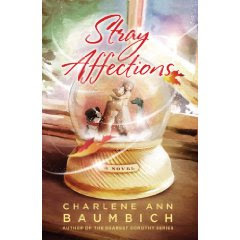 Stray Affections by Charlene Ann Baumbich is on tour Sept 7-11 and I have one copy to give away! About the book: The last thing that Cassandra Higgins expects out of her Sunday is to be mesmerized at a collectors’ convention by a snowglobe. She’s enjoying some shopping time, with husband Ken at home tending their brood of four young boys, when she’s utterly charmed by the one-of-a kind globe containing figures of three dogs and a little girl with hair the color of her own. She can’t resist taking the unique globe home– even if means wrestling another shopper for it! About the author: Charlene Ann Baumbich is a popular author and speaker and an award-winning journalist. In addition to her Dearest Dorothy series of novels, she has written seven nonfiction books of humor and inspiration. A bungee-jumping, once motorcycle-owning grandma and unabashed dog lover, Charlene lives with her husband and rescued dog Kornflake in Glen Ellyn, Illinois. She loves telling stories, laughing whenever possible, and considers herself a Wild Child of God. To be entered in the giveaway, just leave a comment with your email address. One entry per person. U.S./Canada only. This giveaway will end Sept 28. If you can't wait for the giveaway - you can purchase Stray Affections! Oh, I would love to read "Stray Affections." I love, love snow globes. I keep a Christmas one out all year around. It was given to me by my son and his wife and the grandboys. It's a large globe with a Christmas tree on the outside of the globe. Inside there is a teddy bear reaching up to decorate the tree. By him is a toy soldier, a rocking horse, candy cane and a few more toys. When you turn it over, it snows. I would love to win this book. The story sounds just heartwarming. This book sounds really good, I am in need of reading something different! I would love to read this book, as I use to collect snow globes as a child. Brings back wonderful memories. Would love to win! Fell in love with her Dearest Dorothy books! Sounds like a very touching story. Please enter me. Thanks. I can't wait until I can get my copy of "Stray Affections." I own all of the books Charlene has written and treasure them all. Thanks & have a great & blessed day! This sounds great for a fall afternoon snuggled under a blanket! I love snow globes. Please include me in the giveaway. I enjoyed the story about the snow globe! I would LOVE to win this book. I would love to win this book. I do love snow globes! What a cool catalyst: a snow globe. I dig it. No need to enter me, though. Progress on the TBR is slow (but happening). Thanks for the e-mail, my friend. I've got this up at Win a Book for you. Thanks for the opportunity to read this one...sounds wonderful. I'll add Charlene Baumbich to my authors to watch list. Thank you so much for the opportunity of entering the giveaway. As a young girl, I had a snow globe collection. I too was mesmerized by them. Snowglobes are so magical! Would love to read this! I am so looking forward to reading "Stray Affections." Charlene Baumbich has such a wonderful way of telling a story and giving you the feeling of knowing the characters. I absolutely loved the characters in the "Dearest Dorothy" series and miss them dearly. But very much look forward to being swept away to Minnesota in a whole new story of family, strength, and growth. This definitely looks like a fun, magical, can't-put-it-down type of book! My favorite! This sounds like a great read! Different then I normally read! Sounds good. Thanks for the chance to win a copy. This sounds like a wonderful story. I like the unique plot. Thanks for the chance to win a copy. Sounds to be a great book, please enter me into the contest. Such an interesting book - thanks for the chance to win! Sounds fun! I can't believe that summer's over and we're heading into Fall! Thanks for the entry. Thank you for this nice giveaway and please count me in. Sounds like a book I'd love to read. Please enter me. Thanks! Snow globes are one of my favorite things! I love them! Any book that has a snow globe in it sounds wonderful to me. Please enter me in the giveaway! I would love to win this book.